Includes a 2014 Postscript addressing Occupy Wall Street and other developments. Efforts to secure the American city have life-or-death implications, yet demands for heightened surveillance and security throw into sharp relief timeless questions about the nature of public space, how it is to be used, and under what conditions. 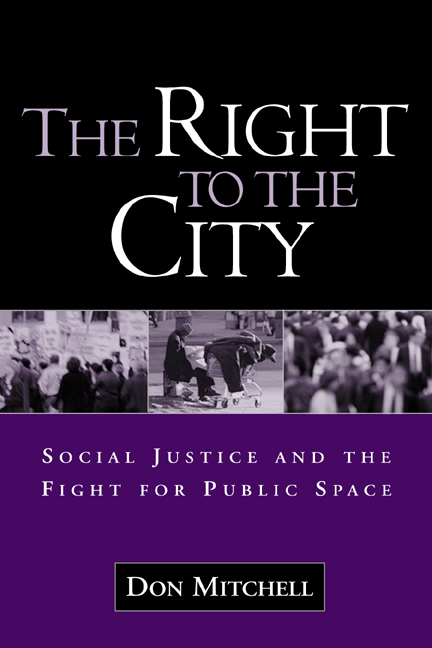 Blending historical and geographical analysis, this book examines the vital relationship between struggles over public space and movements for social justice in the United States. Don Mitchell explores how political dissent gains meaning and momentum—and is regulated and policed—in the real, physical spaces of the city. A series of linked cases provides in-depth analyses of early twentieth-century labor demonstrations, the Free Speech Movement and the history of People's Park in Berkeley, contemporary anti-abortion protests, and efforts to remove homeless people from urban streets.